Shubha Kenworthy grew up watching her free-spirited father painting female nudes while smoking the tobacco he kept in a pouch embossed with a Van Gogh painting. Drawing inspiration from the scene, she snuck to a corner and has been painting since. Kali and the third-eye are prominent leitmotifs in her work. “It’s the all seeing eye of the mind, the centre of knowledge and cosmic consciousness. Goddess Kali is the epitome of ultimate feminine power. I like all that she stands for. She’s a sexual being, the centre of creation, the destroyer of shame and all things evil.” Experimenting with her style, Shubha has started using more colours, block prints and ground marble paste for texture. 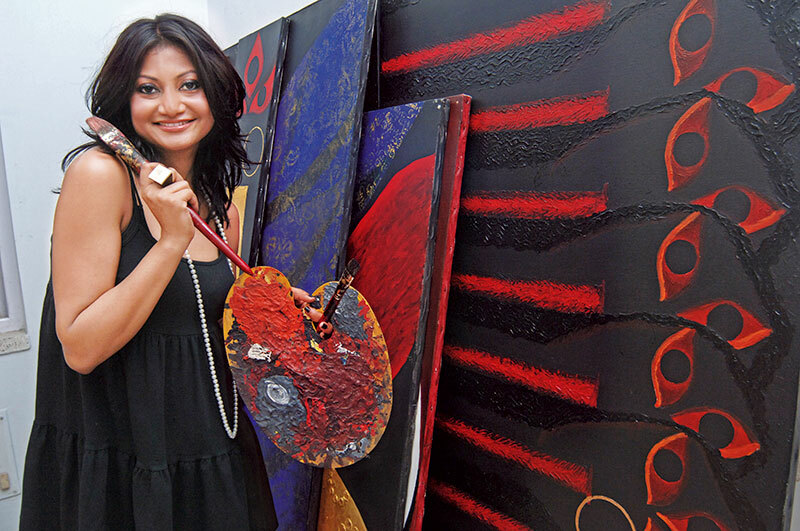 “I am very spiritual but my paintings are contrived with a much deeper social message. My goddess stands for the empowerment of the female. Kali is ancient and I hope I have brought her into this millennium as a muse the young can relate to,” says the unorthodox painter who is also trying her hand at sculptures.